Rebuilding the Twonky DLNA Database is a time consuming process that could take a few hours to complete. 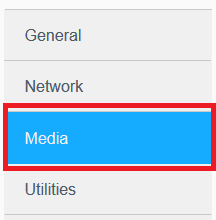 During this time, media connect will not be completely available for use. Attempting to utilize the My Cloud can result in a performance, dashboard and share access loss due to the extra memory and cpu being used to rebuild the index. Please allow the database to rebuild to 100% before attempting to access, view or play the media content. Follow the steps below to rebuild the DLNA Media Server database. Rebuilding the DLNA Server Database can be useful when there's a content visibility or media playback issue. 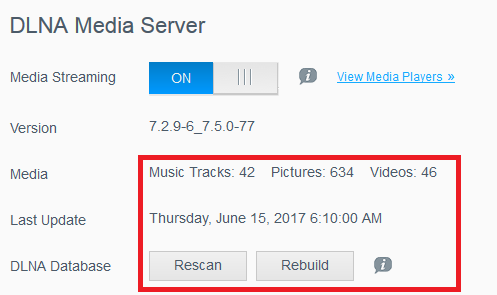 If the Database rebuild does not resolve the issue, there may be a corrupted file triggering the database issue in the DLNA Media Server. Corrupted files and media content can cause a corruption in the Database. Corrupted content issues cannot be resolved by rebuilding the database. The corrupted content must be recognized and removed from the My Cloud or the My Cloud set back to factory defaults. Important: Adding corrupted or problematic content will result in Twonky DLNA Server issues.